Ideal for seeding around or under dense trees. Absorbs and releases water to keep seed moist - even if you miss a day of watering. Germinates faster than uncoated seed. No seed is more weed free - 99.99%. Grows with as little as 3 hours of sunlight. Contains Scotts exclusive Thermal Blue Kentucky Bluegrass. Aggressively spreads to repair thin and bare spots. Survives the scorching heat. 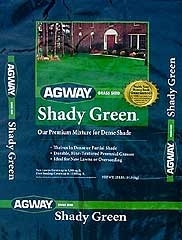 Shady Green is ideally suited to full or partially shaded areas. It is a blend of Fine Fescue, Kentucky Bluegrass, and Turf Type Perennial Ryegrass and will grow well in a variety of soils while producing an attractive turf that needs medium maintenance. One 3# bag seeds 660 square feet for new lawns and 1,320 square feet for over seeding. Shady Green is ideally suited to full or partially shaded areas. It is a blend of Fine Fescue, Kentucky Bluegrass, and Turf Type Perennial Ryegrass and will grow well in a variety of soils while producing an attractive turf that needs medium maintenance. One 25# bag seeds 5,500 square feet for new lawns and 11,000 square feet for over seeding. 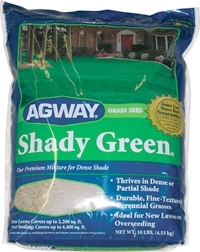 Shady Green is ideally suited to full or partially shaded areas. It is a blend of Fine Fescue, Kentucky Bluegrass, and Turf Type Perennial Ryegrass and will grow well in a variety of soils while producing an attractive turf that needs medium maintenance. One 10# bag seeds 2,200 square feet for new lawns and 4,400 square feet for over seeding.